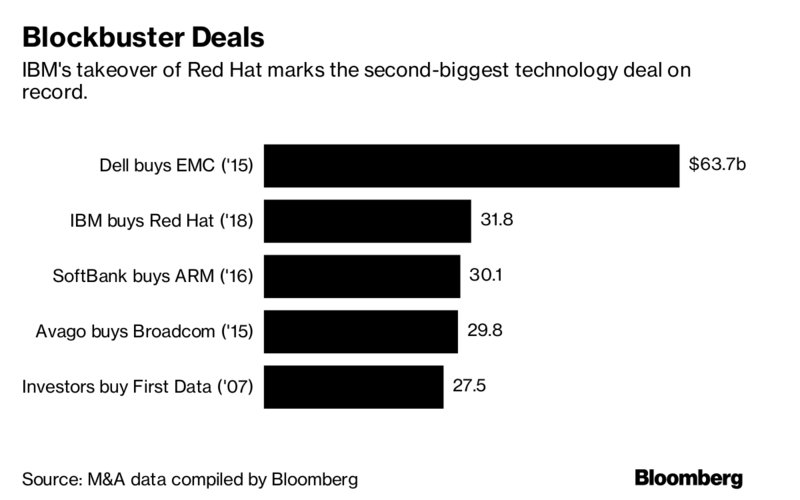 IBM’s US$33 billion purchase of Red Hat Inc. -- the world’s second-largest technology deal ever -- is aimed at catapulting the company into the ranks of the top cloud software competitors. IBM shares declined 2.4 per cent to US$121.85 at 10:47 a.m. in New York Monday, giving it a market value of US$111.2 billion. The stock has dropped 19 per cent this year through Friday. Red Hat’s stock soared 48 per cent to US$172.18 per share. In its third-quarter earnings report, IBM disappointed investors who were seeking more progress in those areas after six years of declining sales that had only recently started to show gains. Still, the improvements had been coming largely from IBM’s legacy mainframe business, rather than its so-called strategic imperatives. Cloud revenue grew 10 per cent in the period to US$4.5 billion, but that was slower than the 20 per cent expansion in the second quarter. Still, analysts said the deal is unlikely to improve IBM’s chances of winning the Pentagon’s US$10 billion cloud contract, known as the Joint Enterprise Defense Infrastructure cloud or JEDI. The project is widely seen to favor Amazon because it’s the dominant cloud services provider and already won a major cloud contract from the Central Intelligence Agency. IBM will suspend its share buyback program in 2020 and 2021. The company plans to pay for the acquisition with a combination of cash and debt, and said it is committed to maintaining strong investment-grade credit ratings. IBM has about US$14.5 billion of cash and equivalents on its balance sheet, according to data compiled by Bloomberg. Revenue at Red Hat, is expected to top US$3 billion for the first time this year as the company’s Red Hat Enterprise Linux product attracts business from large customers. Last quarter the company reported a record 11 contracts valued at over US$5 million each and 73 over US$1 million, according to a note from JMP Securities analyst Greg McDowell. At the same time, sales last quarter overall missed analysts’ expectations and the forecast for the current quarter also fell short, fueling concerns Red Hat may be losing deals to rivals and growth may be slowing. The company said at the time it believes the slowdown has “bottomed out.” Red Hat’s stock is down 28 per cent over the past six months through Friday, according to data compiled by Bloomberg.